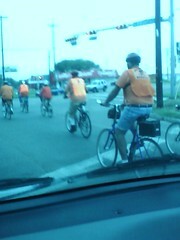 I saw this group of bikers out for a ride in Palmview this morning. They are from the Hidden Valley Ranch RV Park. These are untired retired people. For anybody who is not from the Rio Grande Valley, I should explain that our region is a popular destination for Winter visitors. Our mild Winter weather and low cost of living are popular attractions for retirees. Many, in fact, eventually give up their nomadic lifestyle and settle down in the RGV to live year round.